This is my first post since finishing my 2017 365 Project, which consumed me throughout 2017. Don't get me wrong, I thoroughly enjoyed the self-inflicted pain of having to come up with a new image every day. But in the process, I left a lot of images in complete darkness. I intended to post a lot more than one-a-day, but the time crunch was too much for me, so with very few exceptions, I only got one image a day onto the blog. So here on the blog for 2018 you will see less frequent image posts, but what you will see will be more highly curated. I'll mix in images from last year (I have many images from my trip to Berlin that have yet to see the light of day, for example), and a higher volume of images from individual shoots. The minimum goal is four a day, but you may see more. Which brings me to today's image … As you are probably aware, the US had been locked in near record-breaking cold snap. Here in New England, overnight temperatures dropped below zero for several nights in a row. 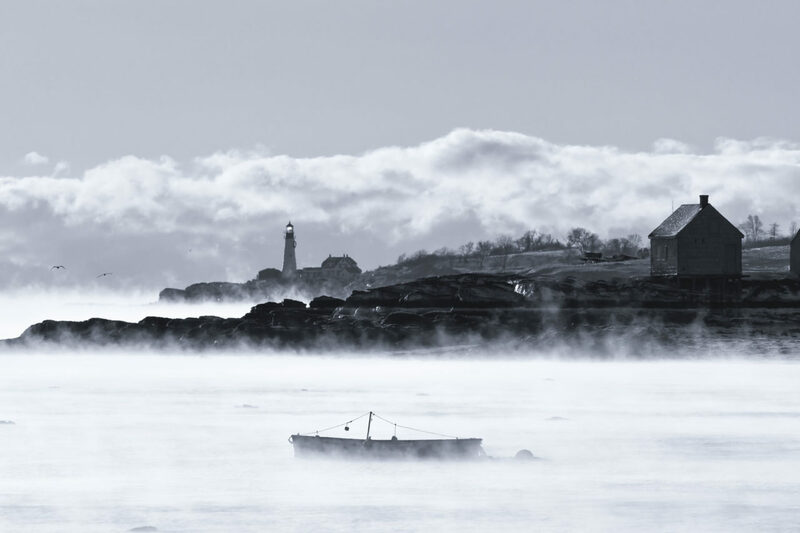 Bone-chilling, yes, but also the perfect conditions to produce the phenomenon of Sea Smoke. So on Sunday I hit the coast of Maine with a couple of friends to capture the magic at Willard Beach, just north of Portland Head Lighthouse. This was the scene looking south from Willard Beach to Portland Head Light.